welovedesign, etc | the graphic design course blog for HND Visual Communication at Edinburgh College welovedesign, etc. : Award Nomination! D&AD announced their Student Awards Nominations and Best-of-Year (formerly the InBook) this week, and our HND Year 2 student Steven Brown has received a Nomination. 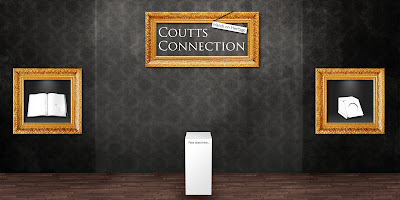 Steven worked on the installation design brief for Coutts, and can now look forward to a trip to the awards ceremony in London on June 26th, and the chance of winning a coveted Yellow Pencil. This is a fantastic achievement - less than 7% of submissions win a nomination or a best-of - and this year there are winning entries from as far afield as Singapore, Australia, USA, various parts of Europe, and of course many of the best Art Schools and Universities in the UK. This is also the third year in a row that we have picked up an award at D&AD. Steven's work can be viewed on D&AD's website in the Installation Design category.